St. Nicholas, Glorious Confessor of Christ, assist us in thy loving kindness. Glorious St. Nicholas, my special Patron from thy throne in glory, thou dost enjoy the presence of God, turn thine eyes in pity upon me and attain for me from our Lord the graces and help that I need in my spiritual and temporal necessities (and especially this favor ______________________________________ provided that it be profitable to my salvation). Be mindful likewise, O Glorious and Saintly Bishop, of our Sovereign Pontiff of our Holy Church and of all Christian people. Bring back to the right way of salvation all those who are living steeped in sin, blinded by darkness of ignorance, error and heresy. Comfort the afflicted, provide the needy. Strengthen the fearful, defend the oppressed, give health to the infirm. Cause all [people] to experience the effects of thy powerful intercession with the supreme giver of every good and perfect gift. Amen. Say one Our Father, Hail Mary and Glory Be to the Father. 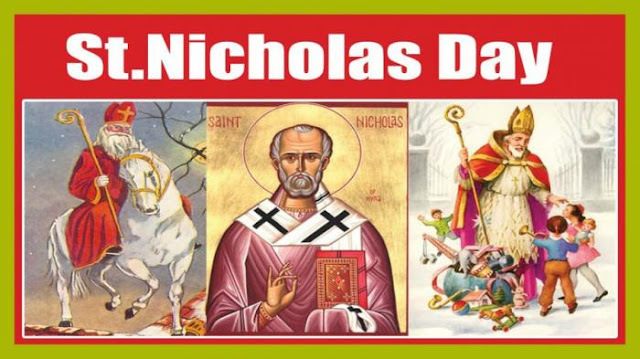 Pray for us, Oh Blessed Nicholas, that we may be worthy of the promises of Christ. Let us Pray, O God who has glorified Blessed St. Nicholas, thine illustrious Confessor and Bishop, by means of countless signs and wonder, and who does not cease daily so to glorify him , grant we beseech thee, that we, being assisted by his merits and prayers, be delivered from the fires of hell and from all dangers through Christ our Lord. Amen. and guide me on the way of salvation. • Holy Nicholas, hear me. • Holy Nicholas, guide me. • Holy Nicholas, help me. in their trials and tribulations. in the things for which I have sought. Be my guide, be my defense, cleanse my soul. and my troubled spirit will be calmed. and that you would provide answers to my fervent prayers. Holy Father Nicholas, hear me. Holy Father Nicholas, guide me. Holy Father Nicholas, receive my petition. Rich or poor—all who call upon you. and love of us all. Amen. show us the way of salvation.